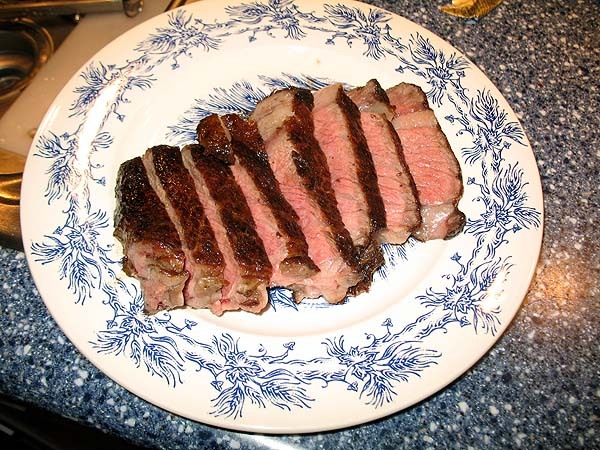 As Alain Ducasse noted in the New York Times in 2002 (article here, discussed here), the standard American method of preparing steak involves high heat. 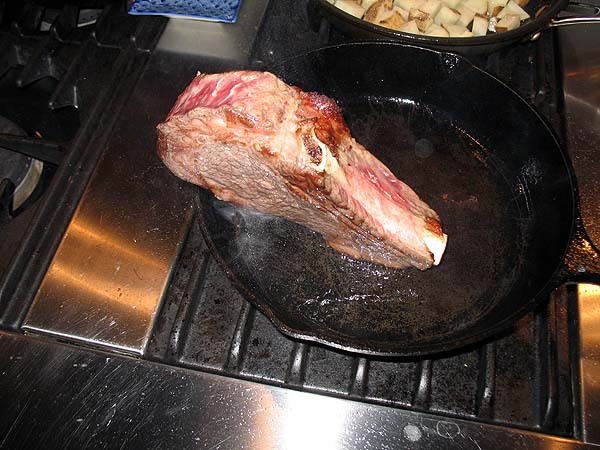 I'd say that 99% of steaks I've had at steakhouses and in people's homes have been cooked either on a grill, under a broiler or in a very hot skillet. Yet, some of the best steaks I've ever had have been served at Ducasse's restaurants (and at other restaurants that use similar methods, such as Tom Colicchio's Craft places), where the steaks are prepared using relatively low heat. 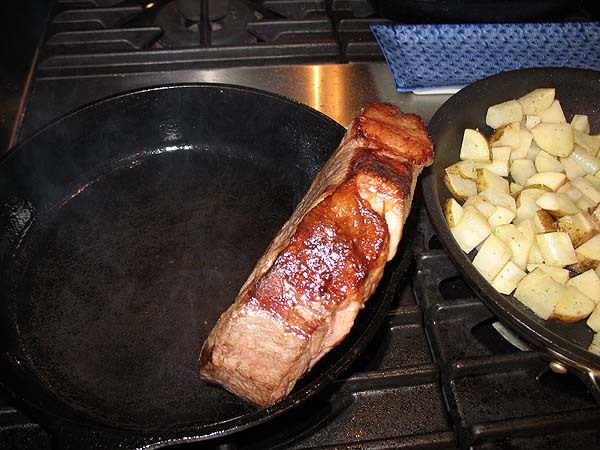 Demonstrating this method -- which I think is perhaps the best way to make a steak and has the advantage of being easy to do in the home kitchen with no special equipment -- is something I've been meaning to do for the past six years, ever since that article came out. The other day, though, inspired by the arrival of a USDA Prime 28-ounce dry-aged bone-in rib steak product sample from Lobel's, I decided to do it. Lobel's is arguably the world's preeminent butcher, and Ducasse the world's preeminent chef, so I thought it would be fitting to introduce the method to this fine piece of meat. One of the points Ducasse makes is that when you have a piece of meat this good, it's a shame to burn it. He prefers, as do I, to get a good crust on the steak with no charring. Once you char a steak, you're substituting the carbonized flavor of burnt flesh and fat for the, in my opinion, more delicious "roasty" flavor of the Maillard reaction and the beef itself. 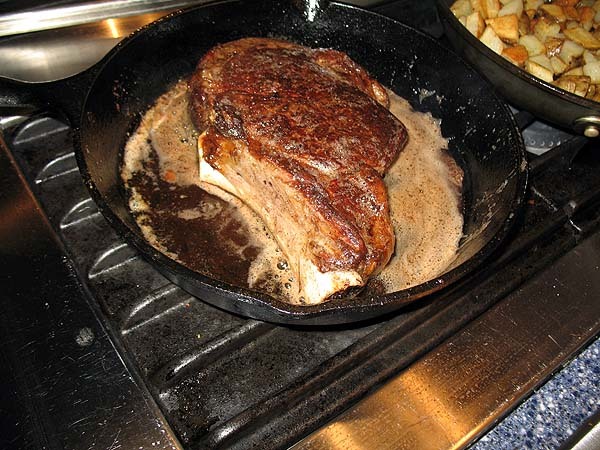 Okay, so here's the Ducasse method of making a rib steak, as interpreted by me. This is a 45-minute process, assuming you start with a steak that has been allowed to come up to room temperature or that at least has been out of the refrigerator long enough to take the chill off it. The method starts with a skillet -- in my case cast-iron but any good skillet works fine as does a pot like a rondeau -- heated to a medium heat. The steak is started on its edge. The reason for this is twofold: first, it renders the fat so you're able to cook the steak in beef fat (this echoes Ducasse's principles of flavor reinforcement, which are nearly universal in his cooking); second, it creates an appetizing appearance on the edges. Now it's time to cook the steak on its flat faces, 10 minutes on a side. The way I prefer to do this, which is not exactly the same as how Ducasse recommends in the Times but is something I've seen done in restaurant kitchens, is to dump out enough of the beef fat so that there's a thin coating of it left in the pan, plop the steak on its flat face, and add a couple of tablespoons of butter. 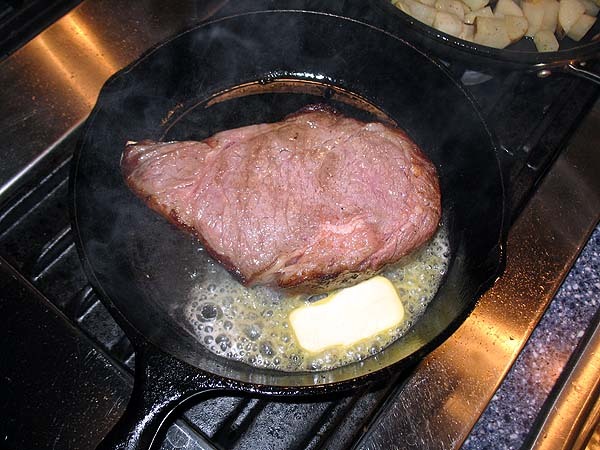 A lot of people recoil at the notion of using butter as a cooking fat with steak, but I've found that butter has two excellent properties: 1- butter, more than most any other fat I know of, is a huge aid to the Maillard reaction, and 2- the combination of butter and beef fat makes a tastier cooking medium for steak than oil. Meanwhile, I've been cooking some potatoes over medium heat in a nearby skillet. 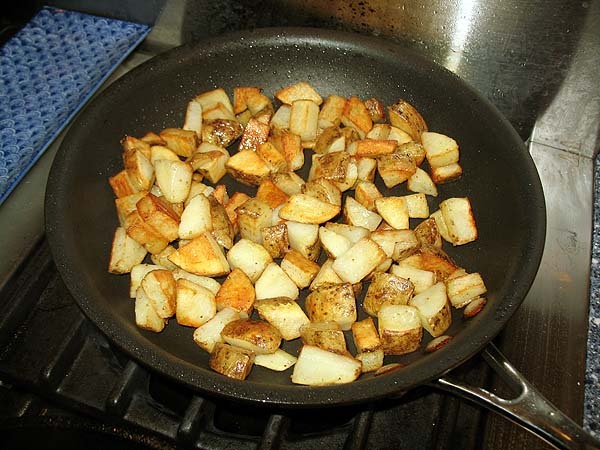 I should mention that if you're looking for a good, simple potato dish to accompany your steak then home fries are a possibility and happen to take the same 45 minutes that the steak takes to cook. 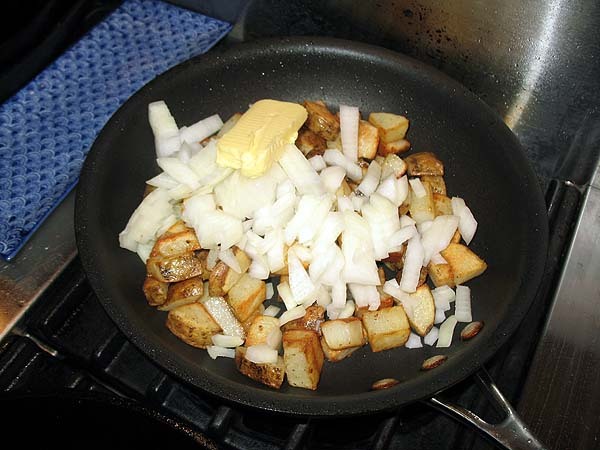 There are a lot of ways to make home fries but this is a method that has worked for me and seems to make home fries that work particularly well with beef. 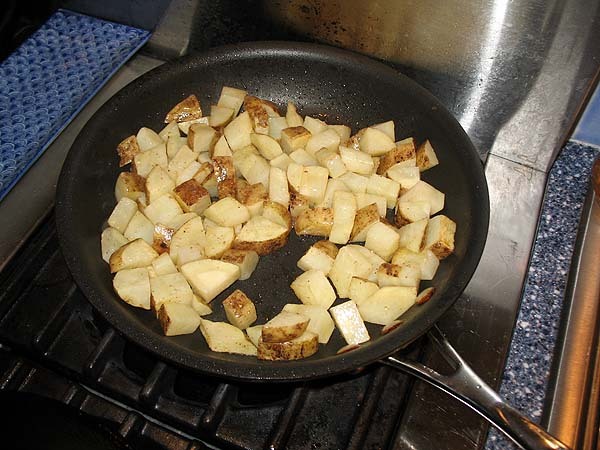 You start with roughly chopped potatoes, salt, pepper and olive oil in a skillet over medium heat. The ratio I'm using here is two medium-size russet potatoes and half a large onion. The onion will go in later, though. If you start the onions and potatoes together, the onions will burn. Now, after about 10 minutes the butter has browned to the point where, if we don't do something, it's going to start imparting burnt flavors to the steak. In the first stages of browning, butter has desirable flavors. But eventually, even with medium heat, it breaks down. So it's time to renew the butter by dumping the cooking fat and adding another couple of tablespoons. I believe Ducasse recommends only adding the butter towards the end of cooking, but I think the steak comes out a little better when you use butter all the way through to coax a little more of the Maillard reaction from the steak. Once I saw that crust -- beautifully browned but not at all charred -- for the first time I became a believer in the Ducasse method. But it gets better. Now you add some more butter, let it melt, and spoon it over the crust (aka basting). This is also when I sprinkle the steak liberally with coarse salt. I know this is much, much later in the cooking process than anybody will tell you to salt a steak, but I find that it yields good results. Here we are about to baste. And the crust gets even better after basting. Continue to cook for about another 10 minutes, basting occasionally if you like (though you've derived most of the basting benefit from the first baste). Meanwhile, our potatoes are coming along, with some browning happening here and there. It's still too soon to add the onions, though. Now we are almost at the 30-minute mark, so the last thing to do is flip the steak and baste (and salt) the other side. Now the steak will have to rest for 15 minutes in a warm place (the Ducasse rule of thumb is to rest meat for half as long as you cooked it) before being carved. I use a warm plate near the stove. A 150-degree oven is also an option, and if you use on oven you can rest even longer without worrying about the steak getting too cool to be appetizing. This is when I add the onions and some butter to the potatoes. It's a convenient timing mechanism: no onions until the steak is out of the pan. It prevents the onions from burning before the potatoes are done, and it also has the benefit of really forcing you to let the steak rest because your potatoes won't be done until the steak is fully rested. After 15 minutes our home fries are done and our steak is well rested. 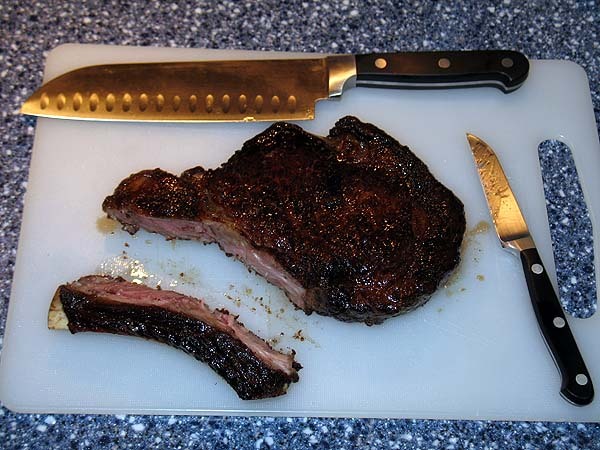 There are fancier ways to carve a rib steak than the way I do it, but this is really simple. You just cut out the bone with a paring knife, then slice the steak. Note that here I use a santoku knife but that's not an expression of personal preference. I don't really like santoku knives. It's just that this happens to be the most recently sharpened knife in my kitchen. If you look at the Times piece, there are some slight variants between the instructions there and the way I do it. In part that's because I'm not good at following instructions and in part it's because I've seen some variation in actual Ducasse restaurant kitchens where I've spent time watching the line cooks cook steaks. Most of all the method affords a lot of flexibility, so a little more or less flipping, turning and time won't have a huge impact the way it might on a super-hot charcoal grill or under a Jade upright broiler. A good variant of this method is the one Dave Scantland chronicles in the Daily Gullet in "The Chronicles of Chuck." Very interesting....Especially when the top steak houses in Toronto all cook their steaks at super hot 800+ degree temps. Surprised you did not use the garlic clove method as I found that idea to be of interest. It's tempting to retain those first few tablespoons of butter for something -- it would be beautifully beefy and brown. How did you know when to stop -- timer, thermometer, finger poke? I imagine that's a pricey bit of beef. I'd cave and snip a bit off the end by the 30 minute mark. OMG! That is a gorgeous steak! I may have to order from Lobel's to get one for our little Christmas dinner and try this method. The Victorians had it right when they buttered their steaks. Many thanks for this, Steven. I kept meaning to check up on your method for steak which I read ages and ages ago but now it's very easy to find. The outdoor grill will still be the method of choice in summer but this way will take over for the long dark months of winter! 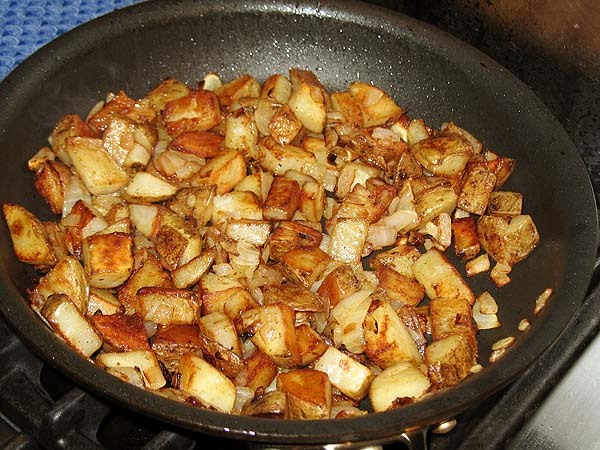 I think I am even more chuffed by your method for home fries - that will get a work out even sooner than the steak. First of all, I've never seen prime steaks like that. I assumed from the pics that they were Kobe. Which of Lobel's steaks did you buy? On their site they list prime, prime dry aged, and natural prime, and maybe others. Your results are beautiful, and I don't understand them. I don't understand how steaks can cook for 45 minutes even on medium heat and not be cooked through at least to medium. Likewise for resting in a 150 degree oven. I agree wholeheartedly with ducasse about not wanting to char a good steak. And with you about the glories of butter. But the nerd in me has trouble grasping why this particular method works. A couple of things Paul. First, just to be clear, this steak was a product sample -- as in they sent it to me for free (as well as a New York strip). The great thing about being a food writer is that even as you constantly teeter on the edge of bankruptcy you can dine like a billionaire. Specifically Lobel's is promoting its meat-of-the-month club. I got a two-month sample. If anybody would like to buy me a subscription for the whole year, I'll be your best friend. 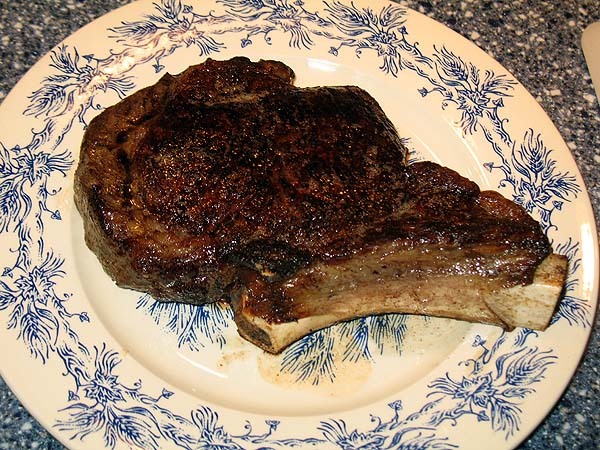 Second, the specific product was this: "USDA Prime Dry-Aged Bone-In Rib Steak." The retail, if you're paying, is $62.98. Lobel's is not cheap but offers the best. In terms of the timing, there are a two main issues. First of all, the 10 minutes spent rendering the edge fat does not contribute significantly to cooking. And second, the steak is really thick -- it's almost roast-like. The Ducasse method only works well on steaks that are thicker than about 1.5 inches, because you need some time to develop that crust. In terms of resting in a 150 degree oven, medium-rare is, according to most charts, 145 in the center and I think my steak was about 140 so it's going to take a long time for a thick steak like that to come up in temperature in a 150-degree oven. In fact I think the outside parts are well above 150 so the heat exchange at least for a little while will go the other way. Peter, long ago I used a thermometer but after the first couple of times I just went on faith. The finger poke doesn't work because that crust makes such a firm shell -- the steak doesn't feel the way you expect a steak to feel. 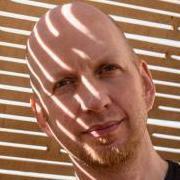 Great tutorial-I've been using this method ever since I first learned it here a while ago. It's really good for pork chops too. I use 2 inch chops (also like a mini-roast) and sub in lard for the butter when cooking pork. It's roastily delicious. Thanks, That was an awesome review! I tried this method when the article first came out, but since then have been cooking steak for a few minutes on the grill followed by a low oven. I will definitely try this method again. Slightly off topic, I am a really big fan of Ducasse's olive mill pasta recipe that was published in the same series. See that one Here. As I read through your post, I thought that this would only really work for a really thick steak. One much thicker than I cook at home. And it turns out that yes, that is the case. From the looks of it, the steak looks like it was seared really hot. Is there any true difference between building up that level of brown goodness slowly vs. doing it quickly? I'm a little surprised that it's mostly pink on the inside from nothing but direct heat cooking. 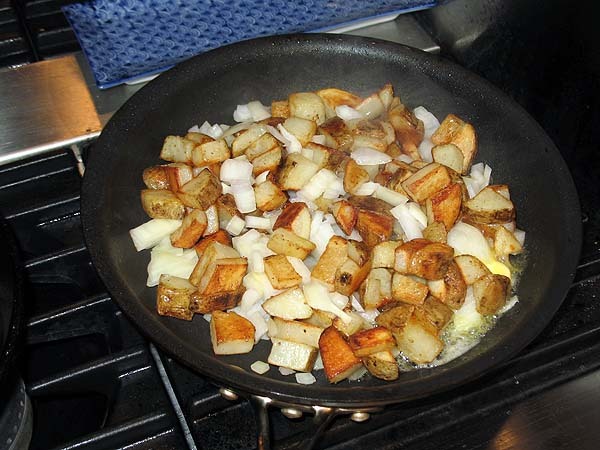 One thought - instead of dumping the unneeded rendered fat from the rib steak, why not use it as the sauté medium for the home fries pommes frittes style? Or, if not enough oil, mix it with the olive oil. 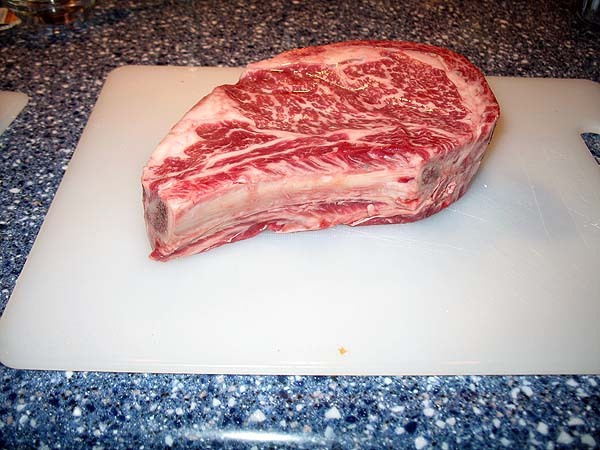 Edited to add - I just checked out the rib steaks on the Lobel's web site. First off your pic looks like a much better steak than the one in their pic. My concern is it looks like they trimmed off most of my beloved deckle on the steak you received. 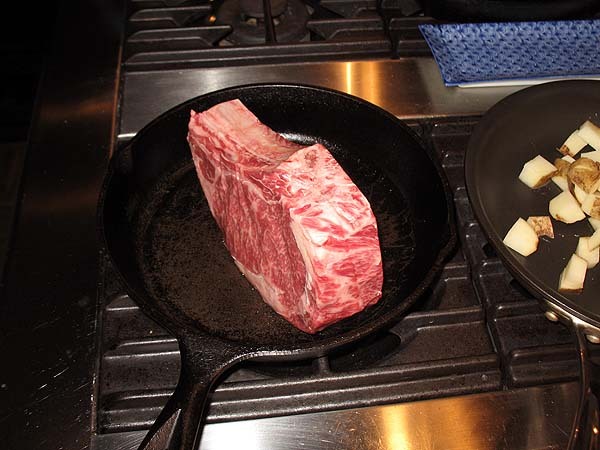 Perhaps a dumb question but, given the title of "The best way to cook a steak," yet seeing that the steak must be at least 1 1/2 inches thick, was Prime, dry-aged Lobels, etc. can you really support this claim? If this will not work will with 90% of the steaks in the US, how is it the "best" way to cook a steak? I think the best way is a quick sear followed by a short trip in a hot oven. This works for every steak (if it's a really cheap, supermarket steak, you just skip the trip in the oven). I've tried that -- in the firm belief that it would be a brilliant innovation -- and just didn't like the flavor. The potatoes absorb a lot of fat and the flavor of rendered beef fat in that amount isn't to my liking. With the steak, which absorbs little fat, it's different. It would probably work well with duck fat or lard but for some reason beef fat is an outlier, at least to my palate. Garlic was part of the plan but when I went to grab my one remaining garlic bulb, which had been sitting around for many moons, I found that all the cloves had dried out and shriveled up within the bulb. To the naked eye the bulb looked great, but as soon as I grabbed it I realized it was a gutted shell of its former self. One problem with the Ducasse method, from a restaurant standpoint, is that it takes 45 minutes. That's just not acceptable for most restaurants, where they want to get your entrees on the table within about 30 minutes of you walking in the door. A 45-50 minute lag between ordering and receiving an entree only works in a Michelin three-star kind of setting where people are already planning for 2-3 hours in the restaurant. So it's understandable why steakhouses focus on quick-cooking methods. Which doesn't mean those methods are best. your pic looks like a much better steak than the one in their pic. The steak I got was one of the best-marbled steaks I've ever seen. It was butchered differently from the photo too -- no big bone sticking out, etc. One thing I should note, though, is that the quality of the steak does not affect the efficacy of this method. Thickness is the bigger issue. 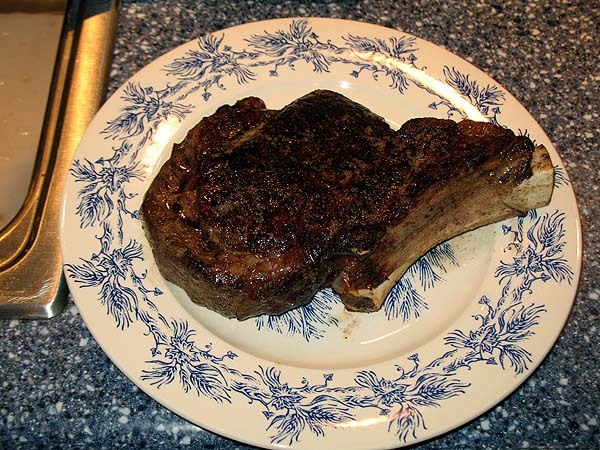 If you get a nice thick rib steak from the supermarket, this method works just as well. In other words, it will make that steak as good a steak as it can be. Is there any true difference between building up that level of brown goodness slowly vs. doing it quickly? Quicker = higher heat. At some point you cross the line into charring, which is not the desired result. You also burn the butter. So you can speed it up a bit but not a ton. 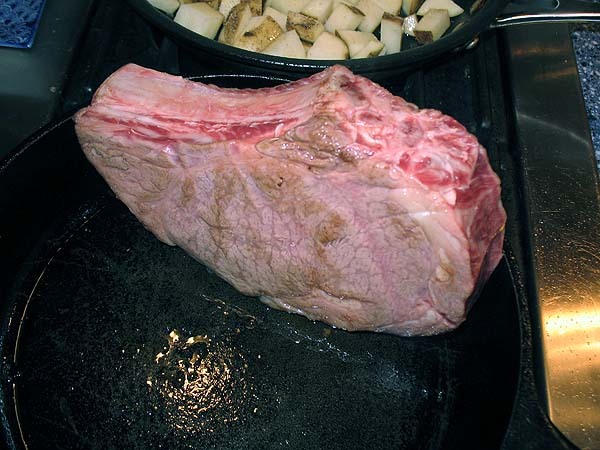 If you're cooking thinner steaks, quicker-cooking methods are I think most likely to give you a good crust while maintaining a pink interior, though I still recommend basting with butter at the end of cooking. The heat of the pan is at least at 300F, yet after 45min the near-surface of your steak still looks deliciously medium-rare (so ~140F). Fat has a higher heat capacity which allows the "steak" to better transfer the heat from the surface into the center right? So this recipe when given a steak with not as good marbling, the meat areas near the surface will be gray and dry instead of pink and juicy? If anything, this method keeps the sub-surface layer in better shape than high-heat blasting methods. But to clarify, the steak is not cooked for 45 minutes. It's cooked for 10 minutes on a side. Prior to that the edge fat is rendered for 10 minutes. And at the end it's allowed to rest for 15 minutes. The hotter the pan the faster it brings the surface of the beef to the 170C or so needed for browning. While the surface is heating up, most of the heat is transferred into the meat underneath it, if the meat reaches 70C it starts to be overcooked ("the grey area"). So the hotter the pan, the less time it takes to brown the surface, the less time and heat is transferred into the sub-surface, the less volume of greyness no? I'm thinking on such a marvelously marbled steak like yours the fat acts as a "buffer" slowing the rate of heat transfer, so even 10 mins of medium heat didn't bring the sub-surface to beyond 60C. Man, what a great lookin steak. Thanks for the post. I've pretty much always done the quick sear then finish in the oven method for my steaks mostly because it's what I've been taught. If I'm cooking up a nice steak that I'm worried about over cooking during the sear stage I hedge my bets and start right out of the fridge (no bringing to room temp). The steak doesn't get charred and grill marks are prominent. The center doesn't have much time to get hot since it has further to go temp wise. This seems to work well for various steaks I've made specially the thinner ones. Anyone else do this? My guess is the centre as lower, more like 135F; the steak about an inch and a half thick; working backwards assuming ten minutes cooking a side gives a pan surface temperature of about 170F. A pity you did not measure it. "medium heat" covers a wide range. Personally I prefer to cook my steak, especially wing rib, sous vide at 55C for 24 hours to let the colalgen dissolve, searing before and after. Just saw a thing on PBS recently along the same lines, only the chef used the oven first, finishing the steaks off in a hot skillet. Two 8 oz steaks, salted and laid on a sheet pan, into a preheated, 275 degree oven to bake for 20-30 minutes, to an internal temp of anywhere from 90-100 degrees. 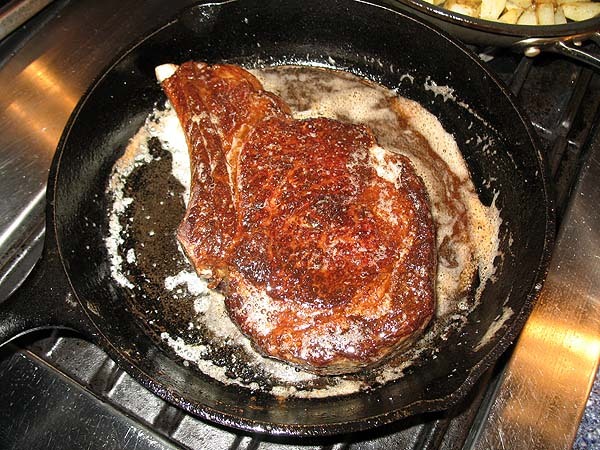 Heat skillet over medium-high heat til oil just starts to smoke, sear steaks each side for about a minute/minute and a half, and then using tongs, take both steaks together to sear the sides. They did a side-by-side demonstration, using the strictly pan-fried steak method for comparison. 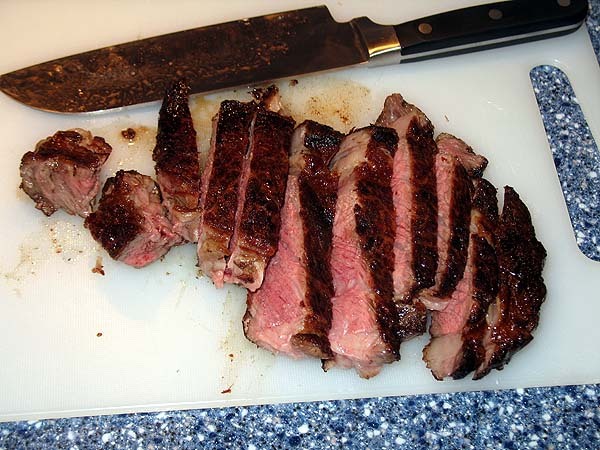 The goal was to get a beautifully juicy, tender steak (rare, roughly 120-125 degrees) without cooking through the roughly quarter inch surface of the steak which you typically get when cooking steak over high heat using only a skillet or a grill. From the look of them, it worked. The side-by-side comparison was pretty compelling. Based on the photos, it looks nicely "charred" to me. And I mean that in a good way. I don't get close to that in a high heat sear. What made me interested in this technique is that lower heat usually means less smoke, which is a problem with a higher heat method in an aprtment with crappy ventilation to get smoke OUT. Also, based on the pics, the butter looks "burned" to me. 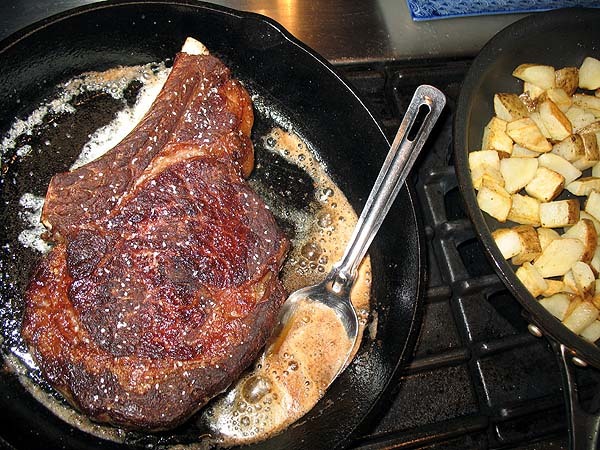 I suppose I could try a butter baste when I do my steaks with a higher heat (or what I think is higher heat) method. But isn't this method just a reverse derivative of the classic method? 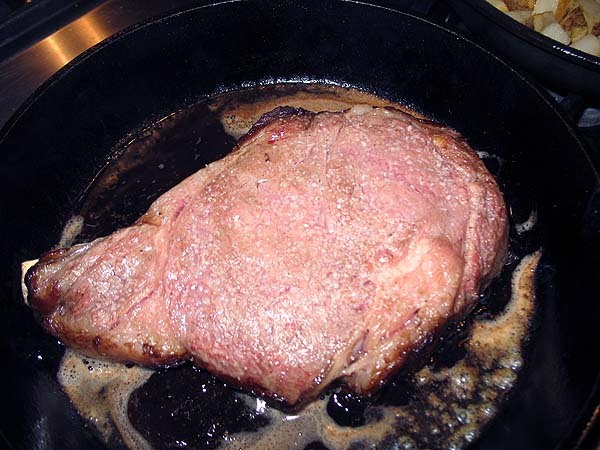 Both uses high heat for a short time to brown the surface and gentle heat to cook the steak through. 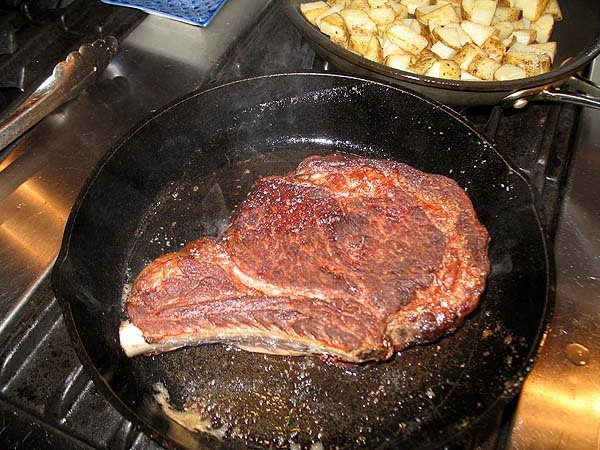 Fat Guy's interpretation of Ducasse's method cooks the steaks for 10 min per side on a 170F pan (jackal10 calculation), which i believe, should the steak have not been so marbled, will yield a area of "greyness".